Sony continues to work on SmartEyeglass and recently presented the Google Glass-like eyewear at CES at the start of the year. 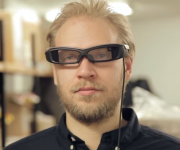 Sony took the opportunity to show off some of the real world business applications that can be used with the SmartEyeglass, in a collaboration with APX Labs. The video below illustrates this best and includes examples of warehouse logistics, surveillance of machines within an industry or easily retrieving patient information in a hospital. APX Labs builds real-time hands-free solutions for businesses and its Skylight enterprise smart glasses platform integrates with several SAP products including HANA and Work Manager.